Well, one thing that can really help you speak more fluently is learning collocations. Collocations are the typical or common combinations of words we use together. When you make mistakes with collocations, the other person will usually understand you – but your English won’t sound “natural” – because it’s different from the way a native speaker would say it. 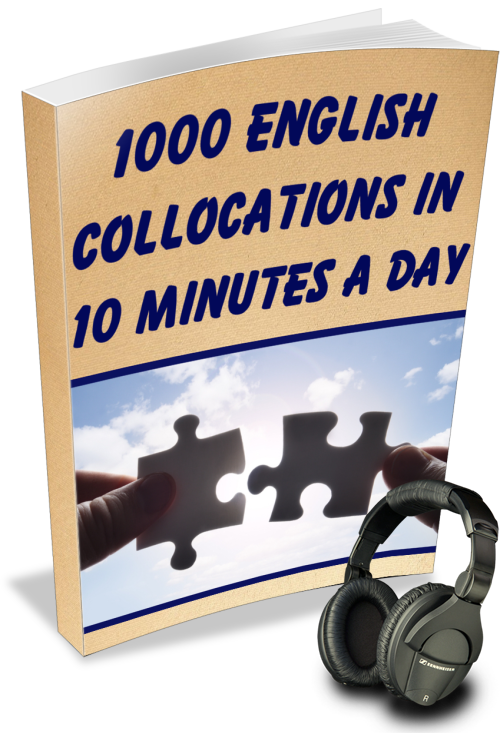 This book will teach you typical collocations, organized into 50 topics. You can get the e-book (PDF format, 128 pages) – with 50 lessons and 50 audio MP3s – for $15. Just click the green button to pay by credit card, debit card, or PayPal – and you’ll get instant access to download the e-book and audio. You can pay for the e-book with credit card or PayPal. I can also accept PagSeguro or Bank Deposit in Brazil – please contact me for the information. I know you’ll love this e-book, and you’ll learn a lot from it – but if you’re not satisfied with your purchase, just send me an e-mail and I’ll send you a refund within 24 hours.